What better place than SaltConf to hold our third Salt Sprint? We’ve never had an opportunity to do an in-person Sprint with all participants and look forward to the opportunity this format will provide to efficiently collaborate on SaltStack development. SaltStack, the full software stack for configuration management, private cloud building, public cloud orchestration and autonomic infrastructure, today announced the next Salt Sprint will be held at SaltConf 2014 on Jan. 29, 2014 running in conjunction with the SaltConf conference party. The Salt Sprint will be sponsored by GitHub. Add more real-time SaltStack command modules. Salt Sprint contributors are welcome to suggest projects for the Sprint by emailing sprint(at)saltstack(dot)com. For those new to developing with SaltStack, the first full day of SaltConf will include a series of labs designed to provide instruction specific to developing and committing code to the Salt project. Salt Sprint newcomers are invited to watch, learn, network and participate. The Sprint will include a friendly code-contribution competition tracked via GitHub, the SaltConf Salt Sprint exclusive sponsor. Fabulous prizes will be provided to winners. For more information contact Salt Sprint organizers at sprint(at)saltstack(dot)com or visit http://www.saltconf.com. 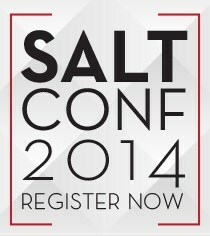 SaltConf, the SaltStack user conference, will be held in Salt Lake City from Jan. 28-30, 2014 and is expected to sell out. Register now at http://www.saltconf.com to reserve a conference pass and a seat in SaltConf pre-conference training. SaltConf is designed to provide the knowledge and training to help attendees automate the data center better and faster than ever before through the power of the SaltStack automation platform for configuration management, private cloud building, public cloud orchestration and autonomic infrastructure. Some of the best and brightest in cloud building and Web-scale automation will speak and attend this three-day conference. SaltConf content will be delivered by SaltStack core engineers, developers, customers and users from organizations like LinkedIn, Wikimedia, VMware, Mulesoft, HP Cloud, Rackspace and many more. Content will include SaltStack hands-on labs and training, and talks delivered by people who excel at building and managing enterprise infrastructure and application stacks using SaltStack software. SaltConf will also offer many opportunities to hack and network with the SaltStack community.